After a year and a half, my ipod has kicked the bucket. Yup, my green, first generation ipod mini has died, leaving me with a hollow ache inside. Yeah, I do think it's dumb how people have fetishized this piece of electronic hardware, and I'm sure it sounds ridiculously overwrought, but it's hard for me not to be upset at losing a very expensive piece of equipment that added so much enjoyment to my everyday life - I used it every day while excercising, commuting and racing around Manchester. Although, lately, things had been less fun. I had to replace the battery ($$) after playing time dwindled to an hour. The clickwheel started acting up, and then it became harder to upload songs. But the end came when I simply updated my itunes, as Apple repeatedly encouraged me to do. You wouldn't think a company's own firmware could actually kill their device, but that's exactly what happened to me and, I found after searching around the internet, a whole bunch of other ipod suckas. The crazy thing is that Apple has shrugged off any responsibility. It discontinued the mini several months ago, even though they were selling like hotcakes. Now I think we know why. You might expect a piece of equipment that you paid that kind of money for to last longer than a year and a half, and to at least, I don't know, be repairable when it does break. I won't bother to detail my fruitless efforts to get some kind of satisfaction from Apple (15 minutes on the phone with the clueless Hassan at call centre tech support and 30 headbangingly infuriating minutes chatting with Stuart at customer relations in Ireland. The upshot is that it's a few months out of warranty, so it would cost more to fix than it would to buy a new ipod, and there are no guarantees the repaired device would last anyway. There's a good New York Times article here that details exactly how insane this is. So, at some point I'm going to need to buy another mp3 player, and given Apple's poor design, bad value and appallingly arrogant approach to customer service, I'm not really jazzed about shelling out for another ipod. The only problem is that itunes really is the best music-managing program I've ever used (I had a Samsung yepp a couple years ago, and the software sucked.) So, if any ur-geek has read this far and knows of an mp3 player with ipod-comparable specs and good software, please speak up. 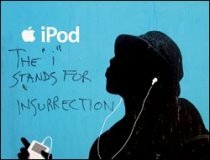 There is a burgeoning anti-ipod movement online, though it isn't, as I'd hoped, an expression of outrage at Apple's rapacious business tactics but a tirade against the ipod as an instrument of social isolation. 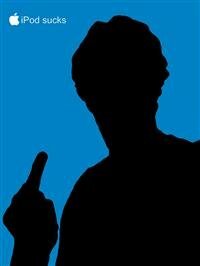 Truthfully, I'm kind of okay with the social isolation. But I'm waiting for the day that people wake up and realize that we've all been duped by clever marketing, and that the ipod isn't all that. Bring on the insurrection. Why not simply choose a different manufacturer? I'm about to make a purchase, and a friend of mine who owns several recommended Creative Labs. Thats really bad Customer Service from Apple considering how much money they must be making for ipod sales! A few years ago, Apple hardware has high quality which partly justified the high prices! Nowadays, it seems all your paying for is their advertising campaigns! I just bought archos gmini 202s, which requires no special software, and is small and cheap for 20G player, but probably not what you're lokin for. Creative are good, as roy said, though the software has a bad reputation. I have no ipod or ianything. Give me a trusty diskman anyday. Thanks for all of the help and commisseration you guys. Yeah, I have heard good things about creative too - so when you buy yours let me know what you think of the software, roy. It will probably take me a while to save up enough dosh. And thanks for the link BM - my ipod was bought for me as gift in the states so I'm not sure whether I'd still have the same consumer rights. I'm planning on writing an angry letter, but I'm not going to shell out money to get it repaired and then chase 'em in the courts. Life is just too short. When I was back in the states my parents got me a cheap-o mp3 player from Wal-Mart. It only holds a gig, but the chips replaceable, it runs off standard rechargeable AAs. It's kinda piece of junk, but the thing is, it broke and I emailed them and they replaced it immediately. Maybe that'st he answer... kinda like with discmans... just start buying the cheapshit. Who really needs to carry 40gb with them? Transfer a good 12 albums over, and when you're sick of em, transfer another 12. My Walkman still works fine..and that's great coz i love being wired for sound..